Bill Gates is one of the best examples of business leaders changing their way to strive towards doing good. 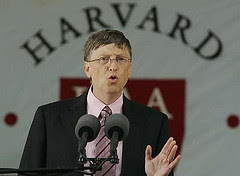 Earlier this year Bill Gates gave an interesting speech on tackling inequities at Harvard. "Imagine, just for the sake of discussion, that you had a few hours a week and a few dollars a month to donate to a cause—and you wanted to spend that time and money where it would have the greatest impact in saving and improving lives. Where would you spend it? For Melinda and for me, the challenge is the same: how can we do the most good for the greatest number with the resources we have? The defining and ongoing innovations of this age—biotechnology, the computer, the Internet—give us a chance we’ve never had before to end extreme poverty and end death from preventable disease... You know more about the world’s inequities than the classes that came before. In your years here, I hope you’ve had a chance to think about how—in this age of accelerating technology—we can finally take on these inequities, and we can solve them. We can make market forces work better for the poor if we can develop a more creative capitalism—if we can stretch the reach of market forces so that more people can make a profit, or at least make a living, serving people who are suffering from the worst inequities. If we can find approaches that meet the needs of the poor in ways that generate profits for business and votes for politicians, we will have found a sustainable way to reduce inequity in the world. Don’t let complexity stop you. Be activists. Take on the big inequities. It will be one of the great experiences of your lives."